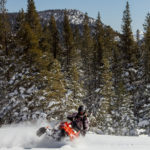 I started snowmobiling when I worked for KG Knutsson (KGK) in Sweden. 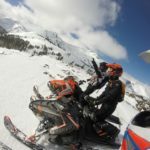 KGK was the agent for Arctic Cat snowmobiles in Scandinavia. They were also the agent for Suzuki Motorcycles and other fun things I got to play with. My job as Advertising Manager for KGK also included doing high-end tours and testing of all new snowmobiles with our VIPs. How lucky can an adrenaline junkie get! That’s how it started. With sleds. I was still racing motorcycles at that time so this was the perfect hobby during the winter months when there was no racing. When I moved to the US, I didn’t continue my motorcycle racing. Pretty much didn’t ride motorcycles at all. But I quickly figured out that Lake Tahoe wasn’t super far from the Bay Area where I settled in. And in Lake Tahoe there was snow in the winter. 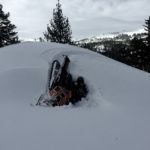 My then husband and I went to Tahoe and I introduced him to snowmobiling. He got hooked right away. I already was hooked. Didn’t take long before we were the proud owners of a couple of Arctic Cats. Fast forward a few years and the 5 hour drive to Tahoe every wintery weekend started to wear on us. We sold the house in the Bay Area and moved to Tahoe. Our sleds were sitting in the back yard, ready to go on any day with white stuff on the ground! All winter I had my son on my lap in front of me on the sled. We rode every chance we got and I became a pro at “one-handing” the sled as I had to hold on to my son with the other hand. We explored every trail, every meadow and every mountain around Tahoe and beyond. My afternoon ride up the mountain to watch the sunset with my toddler was a favorite. I truly loved snowmobiling! Fast forward another few years and I got divorced. Wasn’t really looking for a new man at that time, but if I found one he would for sure need to be a decent snowmobiler. I met John. John is an awesome, talented snowmobiler and snowbiker. We went sledding 3-5 times a week all winter (we met in December) and I stepped up my game from “casual” to “intermediate.” I would go wherever the guys went. It may not have been as stylish but I got there and I could “hang” with some of the better of them. I, a girl, was allowed to ride with them! Somewhere along the line, snowmobiling changed from something I did for fun, to something challenging where I pushed myself a little more every ride to keep up. I got pretty good — well, that’s at least what I like to think — and nobody would accuse me for not trying my hardest. Suddenly, we wouldn’t go ride unless the conditions were “epic.” My sled would sit in the trailer on sunny days unless it had snowed good up until the day before. It just didn’t seem worth the hassle if there wasn’t at least a foot of fresh powder. Preferably three. Meanwhile, my old sledding buddies kept riding and having fun on “hero snow” (our name for snow that’s so set up you can go “anywhere”) enjoying the sunny weather and beautiful scenery. I had graduated to powder-riding and boon-docking and had so much fun. Until one day when I got hurt. Really hurt. I did this stupid sidehill in the trees, hit a hidden rock and got launched and wrapped my body around a tree — back first. My sled came careening after me and I remember thinking “I’m going to die, my sled will crush me.” But the sled missed me and I lived. But man did it hurt! When John, my man, and his buddy found me, I remember asking if they just could shoot me to put me out of my misery. They didn’t. (Thank you.) Instead they used my SPOT to get me a helicopter ride and a healthy (?) dose of morphine. I was on the news that evening. Anyway. $24,000 and 3 weeks later I was back on my sled. Thank heavens for insurance! But it hasn’t been quite as fun since then. I’m too timid to go the places I used to. Too chicken to attempt things that previously seemed easy. I over-think and often just stop instead of committing and going for it. And when you don’t go for it, you don’t get there. The accident was many years ago and I’ve gotten more and more timid. I’ve had great sleds that can do “anything.” But I just don’t dare. In my mind, I still can do all those things I used to do, but it just doesn’t work out in reality. And I come home defeated and disappointed that I couldn’t or wouldn’t. I knew exactly how to flip my sled up on it’s side and do a tight turn uphill. Counter-steer, step back on the running board and braap the throttle. But did I? No. Instead I stopped, considered my options and then turned downhill until I found a flat spot to turn around (to the right, turning to the left made it difficult to reach the throttle). By now my son was on his own sled and I could go out and do “easy riding” and blame it on him. He always saw me as a great rider because the riding he and I did was a piece of cake for me. I looked pretty darn good to a kid! He was a great student and this year he got his first own full-size sled (sled number 7 or so for him). A Polaris 800 Axys. And he realized after a few rides with me that maybe mom wasn’t that good of a rider after all, because now he was on the same sled as me and he could do twice as technical stuff as me. Humiliating. I upgraded myself to an 800 cc Axys too. After my 7th or 8th ride on the new sled, I realized that I was getting anxious before the ride. Even a little scared. One day I felt like I was going to have a panic attack and was hoping my riding partner, John, wouldn’t show up so I could go home again (he showed up, of course). Crazy! I’ve been thinking a lot about this. 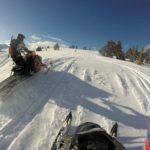 How could I love snowmobiling so much for so many years (like 20+ years), and suddenly feel anxious about riding? 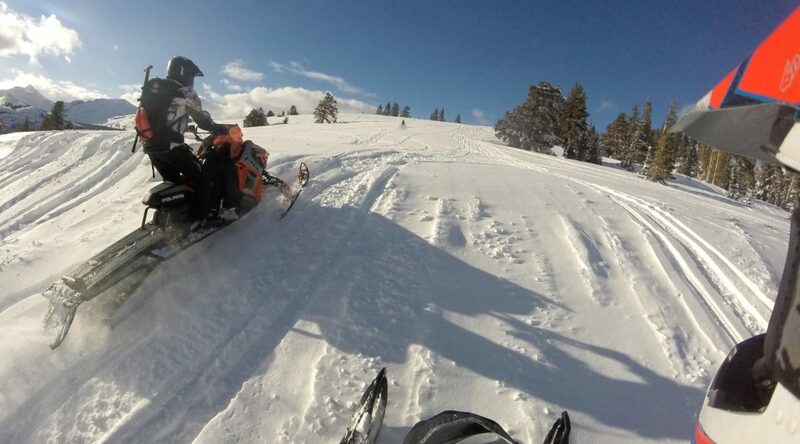 Snowmobiling is a huge part of my life and the reason why I live in Lake Tahoe. The riding here is world class! So I need to fix this. I need to take my expectations down a couple of notches. I’m smarter and older than I was when I did all the crazy stuff. I don’t heal as fast and I need to get back to riding at my own level — whatever that is. I’m not going to try to keep up with the great riders. I won’t even ride with them because I feel so bad about holding them back. They don’t get that I feel this way — they think it’s all in my head. (Like that’s a bad thing?) Apparently guys don’t think at all. If they did they wouldn’t do half of the stupid stuff they do. LOL. My current solution is that I’m going to go spring riding on hero-snow with my old riding buddies again. Hopefully I will stop feeling anxious. When I ride with them, they think I’m super cool and I don’t have to prove anything to anyone. And I’m not holding them back — and I don’t mind when they hold me back because I like watching my friends have fun and enjoy being out and about. I’ve proven my skills in the past and now I can just do the fun stuff and enjoy the ride without scaring myself senseless in order to get from A to B.